With this post, I'll have analyzed a month's sales for every DC zip code save for 20004, sort of a ring cycle for DCHousingPrices.com. 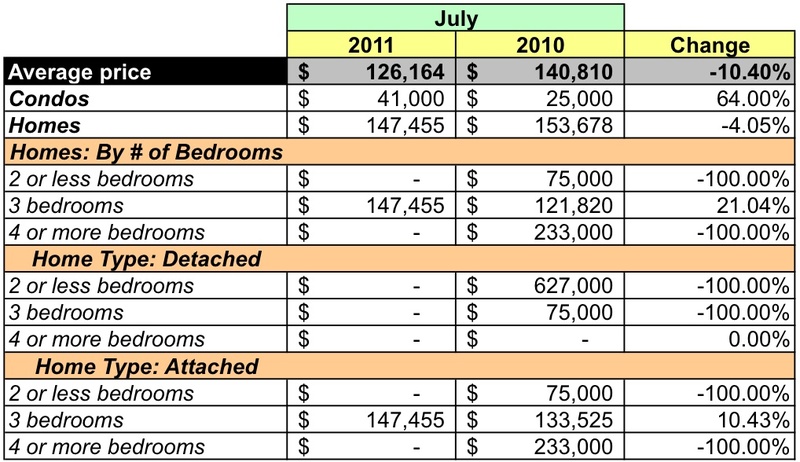 To wrap up the first tour of DC, I analyze July's sales for zip code 20032 using data provided by MRIS and RBI. Forming the District's southeast tip, 20032 is bordered by the Potomac and Anacostia Rivers and the District/Maryland line. Bisected by I-295, it's home to Joint Base Anacostia-Bolling, a.k.a., Bolling AFB, and the Bellevue, Congress Heights, and Washington Highlands neighborhoods. Aggregate dollar volume was down 55.2% over the same month in 2010. Unit sales were 50% lower. The average price for a home fell 10.4%, the median price was down 16.96%. Two homes were sold as bank-mediated sales at a median price of $51,600. One condo sold for $41,000, up 64%. Four houses were sold for an average price of $147,455, down 4.05%. For the past twelve months, attached housing (rowhouses and/or townhouses) have dominated sales in 20032. 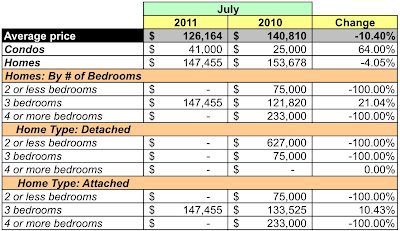 The average monthly sales volume has been 2 detached houses, 7 attached houses, and 2 condos sold per month. 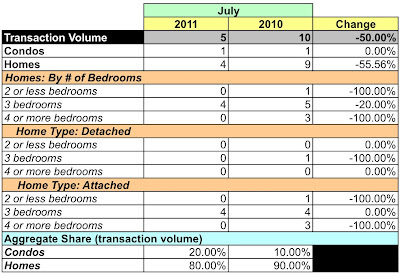 There were 77 active listings during July, 28 condos and 49 houses. The list prices for condos topped out at $300K. Almost all houses ranged from $50-300K, with 2 between $300-400K and another listed at $500-600K. 20032 was barely on the map as a portion of District sales in July. It represented 0.18% of July's dollar volume in the District. Its average price was 78.76% less than the District's and its median price was 73.03% lower. 20032's unit sales were 0.86% of all sales in the District in July. According to MRIS, properties in 20032 sold for 94.2% of the listing price, a 12.03% improvement from 2010. At July's sales rate, there's a 28 months supply of condos and a 12.25 months supply of houses. A buyer's market. Going forward, 22 homes went under contract in July and another 9 went under a contingent contract.